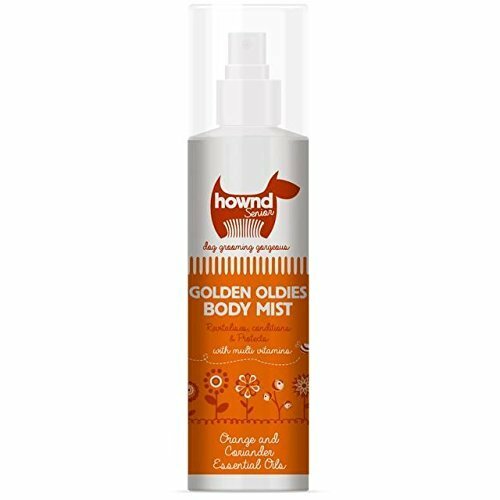 Refresh and revitalize your ageing companion's coat with Golden Oldies body mist. With added Vitamin E and Pro-Vitamin B5 (Panthenol) and gentle odor control ingredients. Relieves dry, flaky skin in older dogs and helps lock in moisture and protect your dog's coat from pollutants. Long-lasting scent of Orange, Coriander & Petitgrain essential oils. This PH-balanced formula contains Argan oil, Oat kernel, Wheat protein & Aloe Vera leaf juice, which together nourish the skin, condition the coat, and leave a wonderful glossy sheen. Free from alcohol, parabens, soap, dyes and harsh chemicals. Safe to use daily. Leaping Bunny certified by Cruelty Free International. Suitable for all coat types including white breeds such as westies, bichons, etc. Can be used regularly as the essential oils and natural ingredients keep the skin and coat moisturized. If you have any questions about this product by HOWND, contact us by completing and submitting the form below. If you are looking for a specif part number, please include it with your message.